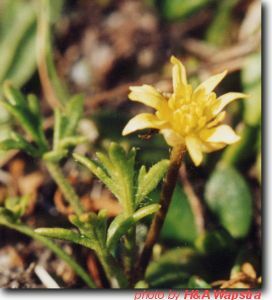 Flowers are pale yellow, solitary and on a stalk longer than the leaves. Small, perennial, mat-forming herb. The grass-green leaves form a basal rosette, and are covered in long, soft hairs. Tasmanian endemic. Occurs from Tunbridge to Campbell Town in the Midlands, on the margins of grassland wetlands. Propagated by seed or division. Note: *It is an offence to collect this species without a permit*. Suitable below powerlines. Seeds turn from green to yellowish and have small beak-like attachment. Ripe seeds fall if brushed. Heads may contain up to 40 seeds but on average, only 10 may be ripe.